Kodiak Island is a phenomenal birdwatching destination, home to populations of both resident and migratory shorebirds, waterfowl, songbirds, owls, corvids and raptors. 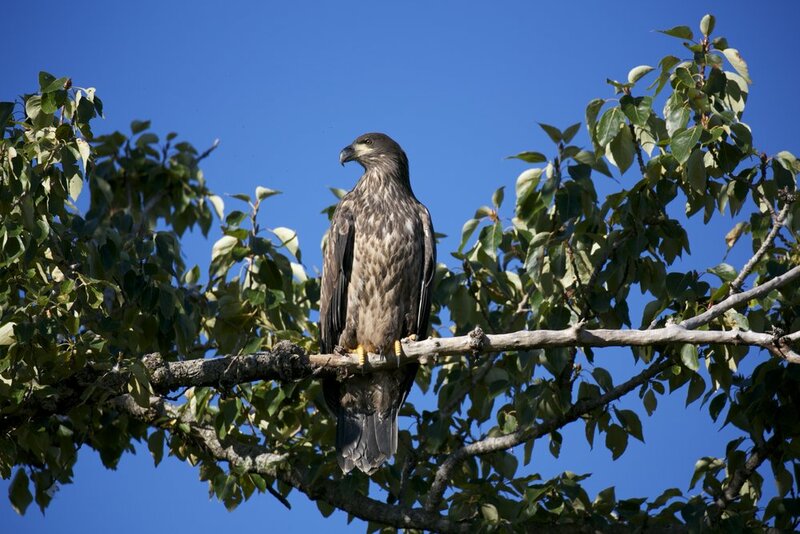 Perhaps the most iconic Alaskan bird of all, the Bald Eagle is a constant presence at Saltery, along with its less common but equally beautiful cousin the Golden Eagle. In July, Saltery Lake is a stopover destination for three species of Loon, as well as a ubiquitous population of golden-crowned sparrows. Chickadees are always visible, especially in camp, as well as Gulls, Ravens, and Magpies. Waterfowl include hooded Mergansers, Wood Ducks, and American Wigeons are complemented by American Dippers and Kingfishers. Birdwatchers who bring high-powered binoculars or scopes to the beaches of Ugak Bay may be rewarded with sightings of any number of uncommon or rare shorebirds in the midst of their migration.